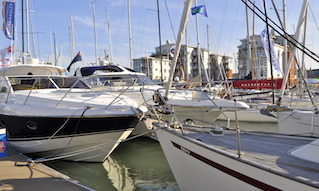 The new dredged Eastern Channel connects the eastern approaches to Cowes with the Inner Fairway just south of Town Quay, enabling small vessels to avoid the main harbour entrance when approaching or departing Cowes from/to the north and east. 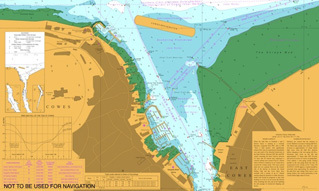 Small vessels, generally less than 20m in length, approaching from or departing to the north or east may use the Eastern Channel provided that there is sufficient water in relation to their draught. The current tide height can be found on the CHC website or on the tide boards located on the Shrape Beacon (east of the entrance to the eastern Channel) and 4A Beacon at the Inner Fairway junction. The minimum depth in the Channel is 2.25m below chart datum. The channel is, at its narrowest, 35m wide and is marked by lit lateral buoys at the northern end and throughout, with an east cardinal marking the eastern end of the breakwater and a south cardinal buoy and the red 4A beacon with tide gauge marking the south-western end where the Eastern Channel joins the Inner Fairway. 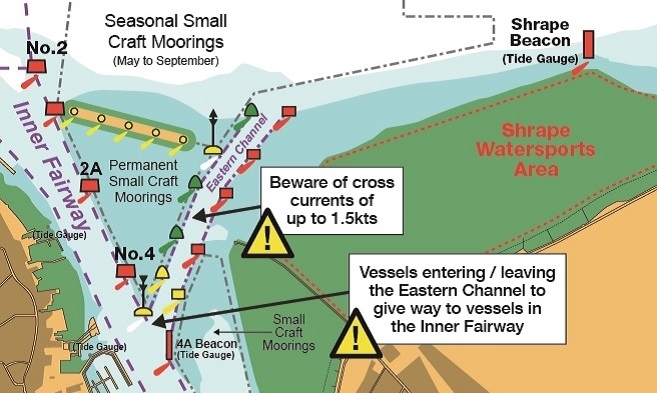 Vessels joining or leaving the Eastern Channel at the south-western end should navigate with extreme caution and are advised to give way to all vessels navigating in the main harbour fairway( Inner Fairway). 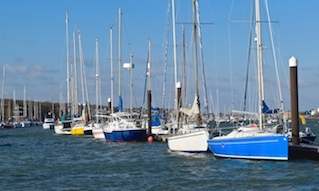 Particular care should be taken to avoid impeding commercial vessels in the Inner Fairway, this includes passenger ferries (Red Jets) turning off Cowes Town Quay and large ferries approaching and departing from East Cowes Red Funnel Terminal. A west-southwesterly current of up to 1.5 knots during spring tides may be experienced between HW-2.5hrs and High Water, west of the Shrape Breakwater. Caution should be exercised so as not to be set into the path of vessels navigating the Inner Fairway or into the small craft moorings. 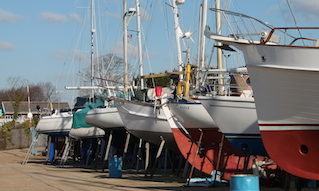 Keep to the buoyed Channel and do not to enter the ‘small craft mooring’ areas either side; these are prohibited areas. Read also the Cowes Local Notice to Mariners: Dredged Eastern Channel.